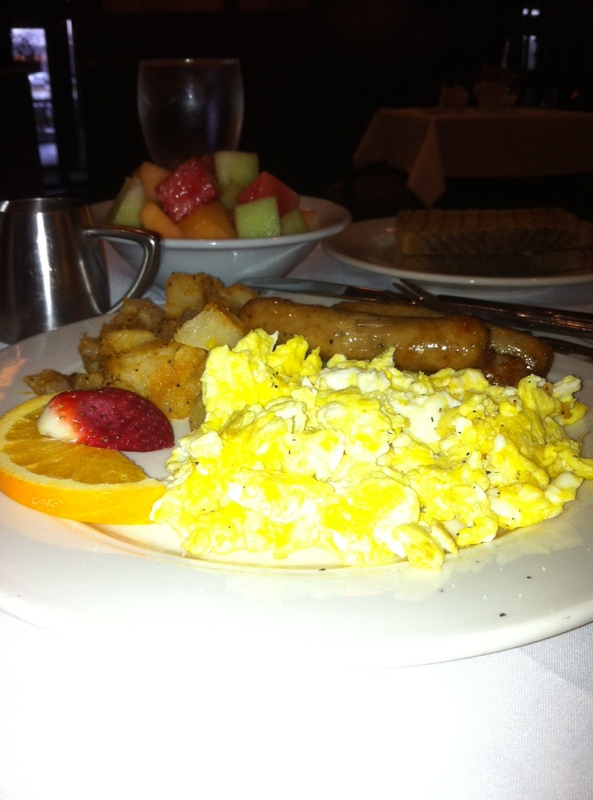 Recently, I stayed overnight at a nice hotel and the stay included a voucher for breakfast. When I went in, the hostess informed me that they weren’t doing the buffet that day but I could order anything from the menu except steak and eggs. No worries. For me, steak is lunch or dinner anyway. I looked at the menu. Three egg omelet? Not unless I’m sharing with someone else. I wanted an egg, maybe a couple of sausage links and some fruit. To order that a la carte totaled more than three bucks more than if I ordered the two egg plate. Yes, I know I was there on a voucher but I figured that if I ordered sausage links and fruit a la carte, due to the price I could expect more than I could eat, right? Just look at that pile of food! So much for the either/or, and the smaller portions, they served me everything and then some. If those equated two scrambled eggs, the chickens must have laid ostrich-sized varieties. I think the potato portion easily equaled an entire spud. There were four sausage links, a sizeable bowl of fruit and two slices of toast. I could only surmise that if the restaurant feels this was a one-person portion size, they must be accustomed to feeding pro football players. I picked at what I wanted, skipping the potatoes entirely. When I was done, I’d still eaten less than half of the eggs, a single sausage link, less than a slice of toast and a couple of cubes of fruit. This caused concern in the hostess and waitress. “Is everything okay with your meal, ma’am,” each of them asked, separately of one another. I assured them that it was but just that there had been a lot of food. Sort of got the feeling that not too many guests thought they were served too much. Make that pro football players, super heavyweight weight lifters and, perhaps, Sumo wrestlers. The waitress came over a second time, and actually said, “But you ate nothing!” Honestly, friends, the amount of food that remained on my plate would have easily satisfied a full grown man. A really hungry, full grown man. I’m a little horrified that before my bariatric surgery I might have chowed down, plowed through, and eaten almost everything, regardless of the gargantuan amounts. It was just more evidence that the eating habits in this country are out of control, including our “normal” portion sizes. If we grow up thinking that this much food is okay, not to mention necessary, it’s no wonder that we’re seeing an increase of obesity in all ages of our population, including kids. Clearly for most of my life my eyes were always bigger than my stomach and I forced my stomach to keep up. Now that I’ve had the vertical sleeve gastrectomy, my stomach’s in charge and leading the way to retraining my eyes. For example, the other night when my friend and I had dinner, instead of going out to a restaurant, we went to Whole Foods and selected what we wanted from their hot food and salad bars. Instead of loading up my containers, I took a slice of turkey, a dab of mashed sweet potatoes, and a half spoonful of the shredded Brussels sprouts. I had all that I needed nutritionally and stayed well within my food plan guidelines. I controlled my portions instead of letting them get out-of-control. Yesterday, a friend and I went to a lovely tea house for a traditional “tea” meal. I have to say that this was a superior treat since both of us love drinking tea and also love the whole ceremony of a high tea. This place also had the perfect approach, probably without realizing it, for someone like me who has a surgically altered stomach. It was a multiple course meal, beginning with a plate of tea sandwiches, followed by a scone. A plate of dessert bites came next and the final item was either a sorbet or a gelato. They also had about 100 different teas from which to choose and I had my own pot of a lovely blend. No lie, that was still a lot of food, but here was the beauty of it. Every individual item was a very small bite. I got to taste everything that I liked without overeating. Perfect! I also handed off things I know I don’t like — such as the cucumber sandwich, stuffed mushroom, and apricot tart — to my friend. All of the tea that I drank also filled my stomach, so I thankfully couldn’t finish the dessert plate. No worries. Whatever we didn’t want to eat then, the waitress offered to box up for us to take home. This meant that late last night, I had a small cookie and a tiny lemon bar as a treat. 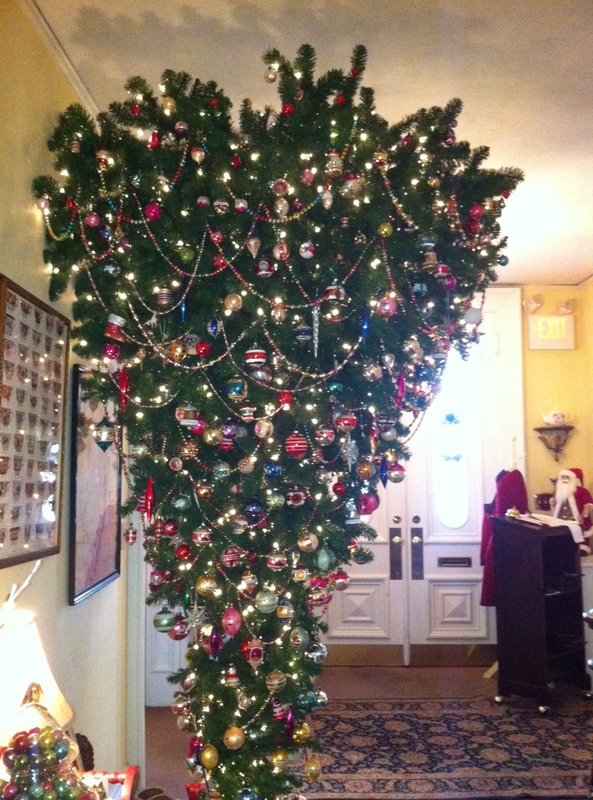 The tea house itself was beautiful and decorated for the holidays, including this cool upside down tree. I wish more and more places would offer “small bite”, or even tapas sections on their menus. If I ever had a restaurant, that’s what I would do. I bet it would be popular with not only the weight loss surgery crowd but also with other people striving to practice better portion control. We Americans have supersized everything! Restaurant portions are enormous. Even our plates are too big. I never use our dinner plates for myself at home, because they hold way too much food. One thing that I will sometimes do is ask for a to-go box with my meal. Then I take most of the food, put it aside and I’m not tempted to eat it. I bet that would also take care of that awkward “are you sure you liked your food?” conversation. I wish that more resaurants offered a smaller plate option. There was a restaurant on the coast that at one time offered what were basically 1/4 sized meals. Plus tiny desserts. They weren’t miniscule in price, but they were just the right size and satisfied me completely, in part because they tasted to full and divine. I think that part of the large portions and overeating problem comes from bland food. If your food doesn’t satisfy your taste, you probably eat more of it. I tend to eat less of highly flavored foods and gourmet chocolates/desserts. The taste itself turns on my satisfaction mechanism. In addition, I find that I eat such foods much more slowly, another factor in satiation and weight control. Now I just need to enact this in my own cooking. The housemates eat much larger portions than I do in general. Maybe they would eat smaller meals if I cooked food that satisfied the palate as well as the stomach. Food scientists have gotten really good at making foods taste just good enough to keep us eating but not good enough to leave us satisfied. They want us to keep eating cheese puffs so we’ll buy more of their products. The science of junk food is nearly Machiavellian. To some extent, so is supermarket product placement. That’s why all sugary junk cereal is placed at the eye level of kids sitting in shopping carts.